If you're looking for an M.2 upgrade, this is the drive to have. 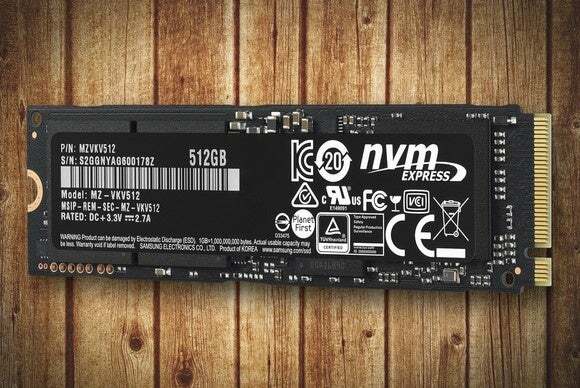 Been hankering after M.2/PCIe NVMe SSD performance, but just not had the cash to scratch the itch? Samsung is here with relief in the form of the 950 Pro—easily the most affordable M.2 NVMe drive to hit the market to date. It uses Samsung’s 3D V-NAND, that is, 3D in that cells are arranged both horizontally and vertically (the V in V-NAND) in layers. Samsung’s V-NAND is a pretty cool product, as it can be treated as TLC (triple-level cell/3-bit), MLC (multi-level cell/2-bit), or SLC (single-level cell/1-bit). As TLC it’s pretty slow (about 400MBps), but in the case of the 950 Pro, Samsung treats it as MLC and the results are very, very good—around 2GBps sequential reading and 1.5GBps writing. Out of the box, the 950 Pro was a complete fail writing—the 35MBps it registered in AS SSD is slow for a hard drive. There was no point in finishing the test as it was apparent that the stock Windows 8.1 NVMe driver and the 950 Pro didn’t like each other much. Once we received and installed the Samsung driver, as you can see below, all was well. 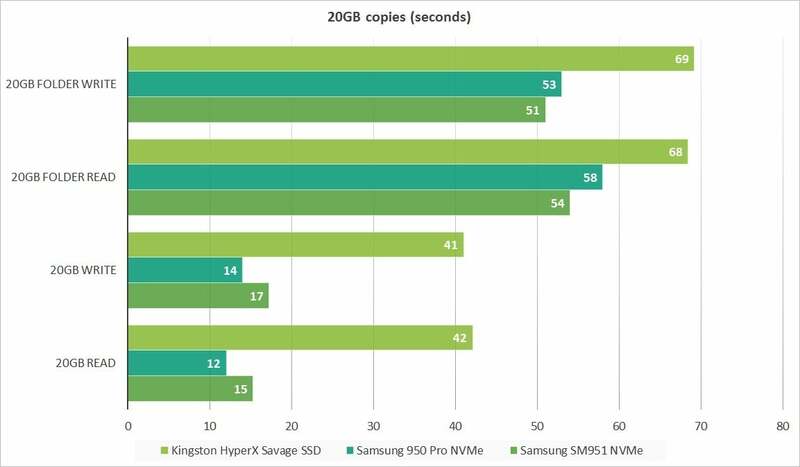 Of course, as some SSD vendors are playing games with cache these days, we like to back up the synthetic benchmarks with real-world copy tests. 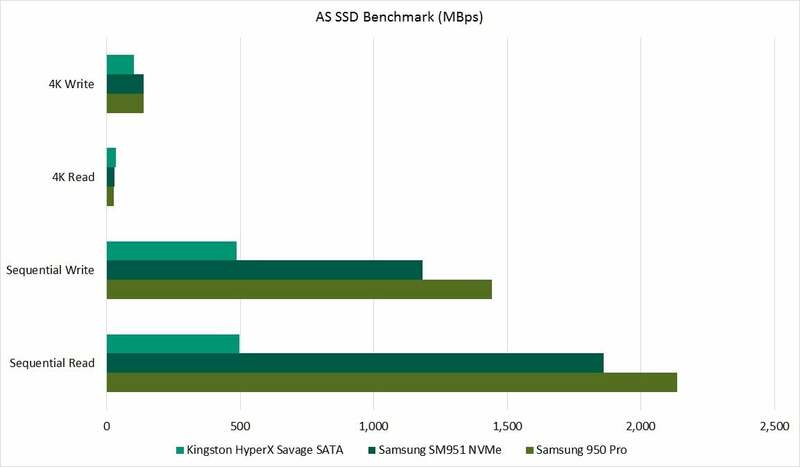 Note that the Kingston HyperX Savage is not one of those, it’s a very good SATA SSD that’s simply shown here to illustrate the difference between 6Gbps SATA and M.2/PCIe/NVMe. No surprises. Unlike some current SATA SSDs, there is no monkey business going on. OK, I told you it was affordable. How about $199 for 256GB and $349 for 512GB? Sure, that’s not 30-cents-a-gigabyte cheapo SATA SSD territory, and the 950 Pro probably won’t see steep discounts any time soon. Considering the performance, 68 cents per gigabyte is pretty darn cheap. Twice the price, four times the performance—I can live with that formula. You might think that Samsung would skunk you on the warranty to make up for the lower margins. You might be wrong. OK, they do a bit. But while it’s not a whopping 10 years as with the 850 Pro, the 950 Pro carries a substantial five-year warranty and an even higher TBW (terabytes written) rating than its older sibling: 200TBW for the 256GB model and 400TBW for the 512GB drive. That’s about a terabyte a day for the larger capacity, which is a heck of a lot more data than most users will write. At 20GB a day, that’s over 50 years—long past the useful lifespan of the technology and most likely your data. This tiny card is the key to ultra-smooth Windows performance. With the advent of the 950 Pro, the time for upgrading your desktop to M.2/PCIe NVMe performance is truly at hand. Grab a PCIe/M.2 adapter card if your computer doesn’t offer a M.2 slot. I promise that you will not be sorry. Laptop users will want to exercise more caution. Even if your laptop supports M.2 drives, it may not support PCIe drives nor NVMe so we recommend careful research before you pull the trigger on a mobile 950 Pro upgrade. M.2/PCIe NVMe SSDs are now affordable thanks to Samsung's 950 Pro. Why is that important? Because 2GBps sustained sequential reading and 1.5GBps writing makes a SATA SSD seem like it's standing still. If your OS or app can take full advantage of NVMe, you'll also get far faster small file performance.